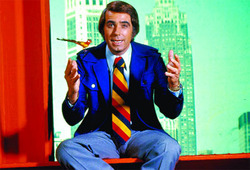 I can't let the death of Tom Snyder pass by without a personal comment. He was a broadcaster's broadcaster. Even though he spent time with presidents, world leaders, famous authors, entertainers, politicians, business tycoons and star athletes, he would still prefer to sit and talk with a person who worked in local radio or TV. Informal chats with fellow broadcasters seemed to stimulate the core of his being. Tom, I believe, always fancied himself a local broadcaster who was dabbling for awhile on the national stage. In the 1970s, every weeknight, I was one of some six million Americans who were regular viewers of the show that followed Johnny Carson on NBC called, simply, "Tomorrow". Watching Tom masterfully conduct those revealing, one on one interviews became required viewing for those of us working the late shifts. Tom strongly believed in the power of people and their words. He didn't use a fancy set.... his interviews were mostly done in black limbo. He didn't feel the need to put distracting banners on the screen with the guest's name. His interviews could, at times, be magical. The simple truth is.... we all watched to see Tom, no matter who the guest might be.... we knew Tom, at least, would be fascinating. I first met Tom Snyder in 1989 when -- much to my surprise and delight -- he invited me to be a guest on his ABC Radio talk show. At the appointed time, I showed up at the ABC studios in Hollywood and was escorted to the green room to wait for my turn with Tom. I confess I was nervous, wondering if I'd have anything interesting to say. Suddenly from down the hall I heard that loud, familiar voice approaching. I always knew he was a big guy, but he was still a surprising presence when he entered the green room and shook my hand. A lumbering 6'5", with that laugh that immediately brought to mind Danny Ackroyd's on-the-money spoofs of Tom on Saturday Night Live. He called me "young man" and told me he enjoyed my work on the Pat Sajak show, and that he had watched me when I was anchoring the news at KCBS. He then asked if I wanted any coffee while I waited to be interviewed. That's stuck in my mind...... Tom Snyder asking if he could get me some coffee. On the air, we talked a little about the Sajak show on CBS, where I worked as a cast member. But for most of the hour we talked about the old days of radio and TV, and some mutual friends we had made along the way. We took calls from listeners across the country. We talked about his days hosting "Tomorrow", and about NBC's ill-advised decision to add a live studio audience, not to mention a co-host (gossip columnist Rona Barrett). He wasn't shy about making it clear it was a change he never wanted or approved of. Tom articulated the dramatic shift in the dynamics of the show for both him and the home audience. No longer was he talking through the camera directly to the people at home.... now he found himself performing for the studio audience, with the home viewers on the outside looking in. After my appearance on his radio show, Tom told me he'd like for me to consider substituting for him occasionally when he was on vacation. But in the months that followed, he called and I filled-in on at least three occasions. It was, for me, a rich and rewarding experience. In 1993, I was back home to Nashville doing a talk show on TNN. After my show was cancelled, I got a call from Tom's producer, asking if I'd fly to California and be a guest on Tom's CNBC cable talk show. I would never have suspected that Tom Snyder had actually watched my little show. It turned into another wonderful experience for me with this impressive man. Tom had a way of making everyone he interviewed interesting. And even if they weren't.... he was interesting enough himself to carry the load. Now Tom, from all of us who work the late shift in Tennessee, so long and sweet dreams.